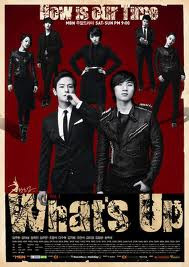 Cast: Im Joo Hwan, Im Joo Eun, Kang Dae Sung, Jang Hee Jin, Oh Man Suk, Lee Soo Hyuk, Kim Ji Won, Jo Jung Suk, Jin Jung Hoon, Kim Mi Kyung, Kim Chang Wan . . .
We follow 6 freshmen students of the theatrical department at a university. Jang Jae Hun (Im Joo Hwan) is a youngster who spent most of his time out on the streets, often getting himself in trouble. One night he happens to get into an accident causing another person to get hurt. It becomes somewhat of an eyeopener and he regrets how he used to live. Right at that time he finds out that he is accepted into university, he decides that it's his chance to change and decides to enroll, not even knowing what he will be studying. There he meets his friends Park Tae Hee (Kim Ji Won) a young innocent country girl with a great passion for music which she got from her late father, Ha Do Sung (Kang Dae Sung) a young guy who loves producing new music despite his background and the lack of support from his family, the same goes for Kim Byung Gun (Jo Jung Suk) who comes from a family of doctors, but has decided to pursue music without the knowledge from his family. Lastly Oh Doo Ri (Im Joo Eun) who came to the school to find her freedom. We follow the friendship of these guys, through school and romance, trials and challenges, as they get to know each other and learn to stand up for one another. The drama is quite alright, it is not amazing but if I should compare it to for example dream high, dream high was much more about singing while this one focuses on friendship and life, not that dream high didnt. It did become a bit annoying in the end with some situations that were too.. dapdaphae.. and I think they didnt do much out of the ending as we might have expected. But I loved watching their friendship grow, and it did have plenty of funny moments. The heaviness just ruined it a bit.. it might have been too cliché but hey it is a korean drama LOL. So I think if you're looking for something a bit alike dream high but more friendshipish or lifeish then this would work for you. The drama starts out with an amazing kick, though you already from episode one know what is going to be the ‘love problem’ in the drama. I have to say I didn’t think it was that dapdaphae compared to many other dramas I’ve watched (hint: Secret) but yes the few last episodes are a bit annoying with the love story. I did not expect it to be sad, even though they do show at the beginning what was going to be, but you sort if forget that while watching the drama. The friendship and the musicals are great - however it did remind me a bit too much of the movie Fame.. Which I can’t really understand why. So do I recommend it? Yeah, it is a good drama.